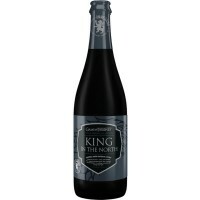 A beer for Jon Snow - a dark and brooding imperial stout has always been bold enough for normal times, but now that winter is here, something bigger and bolder is needed for the long, dark night. Thus, we enlisted the help of barrels and time to produce King in the North, a rich, bold, barrel-aged imperial stout unlike anything we’ve brewed before. Aged for 6 months in bourbon barrels.